The Plan is a tax-effective way to save for retirement. Your contributions to the Plan are tax-deductible, and the matching contributions from your employer are not a taxable benefit. As a member of the Plan, your retirement funds in the Plan are sheltered from taxation until you retire or withdraw them. Your personal retirement savings such as a Registered Retirement Savings Plan (RRSP) can also make an important contribution to your retirement income. Plan members should be aware that the pension earned in each tax year will reduce the member’s available ‘RRSP’ room in the following tax year. RRSPs are tax sheltered savings arrangements that allow you to save for retirement on a tax-deferred basis. Your “RRSP room”, which is reported to you each year by the Canada Revenue Agency (CRA), is the amount you can contribute to your RRSP annually. You also need to have enough RRSP room to make certain past service purchases, if you are eligible to do so. CRA advises you of your RRSP room on the Notice of Assessment you receive after filing your income tax return each year. Pension adjustments are calculated annually by your employer and reported on your T4 form. Pension adjustments are one of the factors used by the Canada Revenue Agency (CRA) to determine your RRSP contribution limit. The other factor is your earned income in the prior year. PA = (9 x pension entitlement for the year) minus $600. If you purchase any service earned after 1989, your PA for those years has to be adjusted retroactively. 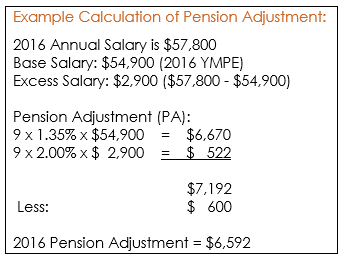 This is called a Past Service Pension Adjustment (PSPA). A PSPA ensures that your RRSP room matches what it would have been had you continued to be a contributing member at that time. The pension adjustment reversal is intended to restore RRSP contribution room which may have been lost while you were a member of the Plan. If you leave your employer for any reason other than retirement or death, and cease membership in the Plan, a pension adjustment reversal is calculated at the time your benefit is paid. The pension adjustment reversal is the difference between the sum of the pension adjustments reported for all years after 1989 and the amount of termination benefits refunded from the Plan. If the benefit paid is less than the sum of the pension adjustments, the difference will be reported to CRA and the RRSP contribution room will be restored.